Gmail's contact cards, which show up when you mouse over the sender of a message or a Gmail Chat contact, have a new interface. Action buttons are displayed at the bottom of the card and you can no longer edit the name of a contact inline. When you click on the name of a contact, Gmail opens the contact manager. Contacts cards haven't changed too much since 2007, when Google released a major Gmail update. 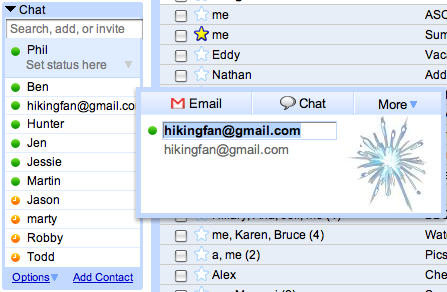 If you'd like to see how much Gmail has evolved since 2007, open Gmail's old version. It's surprising to see that Gmail still offers the old version, which lacks most of the features released in the past three years. You and dabbster say how nice it looks, but, IMHO, I don't notice a huge difference, and now I can't edit my contact names directly. Ah, well. I'm just hoping against hope this has something to do with the all-signs-point-to Gmail/Google Voice VoIP dawning. Weird, as soon as a contact card pops up, my screen jumps to the bottom (e.g. I can see how much storage I have, account activity, etc). I guess it's being rolled out slowly since my account still has the old card interface. I really miss the inline Edit contact name, they could add an mouseover icon near Name to edit it inline. Ironic how the sample screen-shot looks suspiciously like the blog comment spam we see a lot in a popular blog; were blogspot to do some basic datamining of comments and spam (which languages and links does a site always delete, what poster characteristics can you view as suspicious) there'd be less such comments to filter through. Disappointing that they didn't include any decent extra functionality. Would love to be able to categorize contacts from the card. I like the button placement, but I actually miss the border around the contact card. I thought it looked nice. >my account still has the old card interface. It's almost 12 hours later, and I still have the old cards. GMail began to be very annoying in hiding my labels, considering, of course, that I didn't enable that Labs thing to hide them. It just started few days ago to hide them and I hate it. Where can I send an e-mail to them to fix this bug? Hiding labels is a standard Gmail feature, it doesn't have anything to do with Gmail Labs. Well, IMHO also, I just appreciated other's work. Yeah, it's not a huge change. Tiny. That happens to me a lot when I try to click recent converstaions. It's a browser flaw; the popup menu is often partly out of the window, and when you click on it I think it moves it up and then processes the click, which puts it on 'invite to chat' instead of 'recent conversations. I hope they fix that, it's annoying.